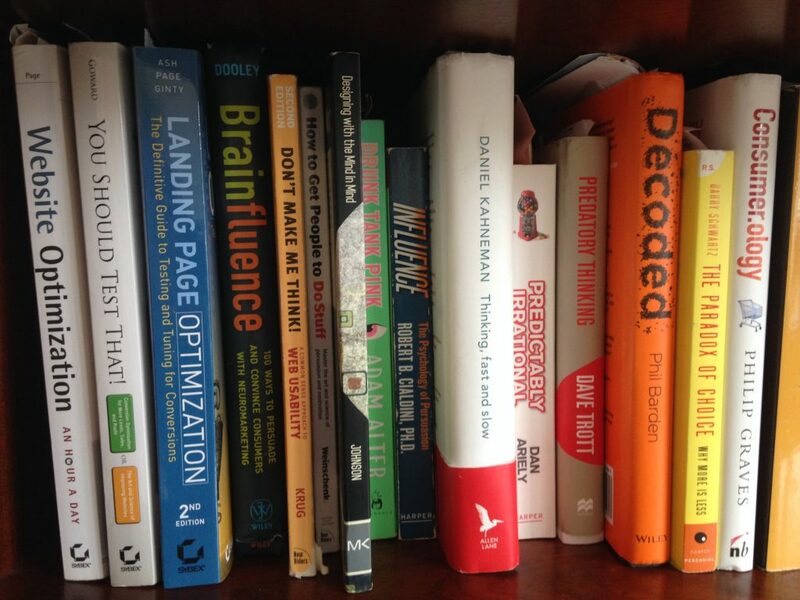 Here are twelve brilliant digital marketing books that will give you insights into conversion rate optimisation and provide help with marketing, design, usability and the psychology of visitor behaviour. These are excellent books for helping you define your strategy and identify insights to develop hypothesis for website/app and landing page design and optimisation. The first three books are specifically on conversion optimisation. You might think that I would suggest just one of these books to read, but I can honestly say that each brings a different perspective to the subject and I would highly recommend that you read all three. 1. Website Optimization – An hour A Day – Rich Page. interest. However, the more I dipped into it and read whole chapters I realised that this is a gold mine for anyone wanting to really appreciate how to optimize a website. It’s one of the most detailed digital marketing books you will read. It is crammed full of ideas on what you should be testing, but more importantly it is especially good for outlining a systematic process for optimisation. This is essential for your success as without a consistent and data driven approach to optimisation you will struggle to maintain focus and you will certainly not achieve an optimal return on investment (RIO) from your A/B tests and Multivariate Testing (MVT) tools. Rich explains everything from investigating your analytics, and choosing tools, to putting together a testing plan for a page or journey. As well as being great for understanding the process of optimization there is a lot of detail on the specifics of what to test. You can tell that Rich has a massive amount of experience on the subject of testing and he holds nothing back to help you identify areas and approaches to testing. I found this book particularly good for developing check lists of how and what to test. 2. You Should Test That! Conversion Optimization for more leads, sales & profit or the Art and Science of improving websites – Chris Goward. Chris Goward founded website optimisation specialists Widerfunnel and he shares their approach in one of the best digital marketing books I’ve come across. Despite it being a fairly thick book I found I struggled to stop reading it. You can tell Chris is well read as he brings insights from a wide range of sources and has a more holistic approach to the process than many of his peers. This is probably the most strategic of digital marketing books I’ve come across. It has a brilliant chapter on persuasion and models of human behaviour that is a must read. The Lift Model that Widerfunnel employ has been widely adopted as best practice for heuristic evaluation of a page. It is fully explained in the book with great examples of how to use it in practice. Chris’ book is also brilliant for dealing with objections to testing and how to engage people in the process of optimisation. There are also a huge number of examples of tests and many vivid images to illustrate the nature of these experiments. I found Chris is particularly good at advising how to develop strong hypothesis before you go ahead with an experiment. A weak hypothesis is often the cause of many unsuccessful tests. Although we learn from our failures you do need a regular stream of successful tests to convince your stakeholders to maintain their support. 3. Landing Page Optimization – The Definitive Guide To Testing and Tuning for Conversions – Tim Ash, Rich Page and Maura Ginty. One of the classic digital marketing books given the importance of landing pages to marketers. Landing pages are the bread and butter of our trade and this book is a comprehensive guide on how to optimise the beginning of your funnel. However, as Tim points out in his book, visitors can land on a multitude of pages and it is important to seek to optimise all pages, including your homepage, where user first arrive on your site. Many people think that landing pages are simple to design and optimize. When you read the book though you will get a better appreciation of how complex this process is and the importance of understanding how such pages fit into the overall customer journey. Tim and his co-authors take you thorough and systematic process of optimization. This book is much more than landing page optimisation. Sure, it covers the seven deadly sins of landing page design, but it also outlines Tim’s conversion Ninja toolbox to help you diagnose problems, identifying psychological mismatches with your visitors and fixing site problems. Other chapters include the strategy of what to test and the mechanics of testing. The book gives you a broad understanding of optimisation and testing, but it also has many practical examples and ideas for your testing roadmap. 4. Brainfluence – 100 Ways To Persuade and Convince Consumers With Neuromarketing – Roger Dooley. drivers of our behaviour than we appreciate. Roger uses a broad definition of neuromarketing to include behavioural science and behavioural-based strategies to help us understand how our brain works and how to translate this into improving our marketing and our products. Roger has carefully extracted and summarised the insights from hundreds of interesting pieces of research to provide a stream of practical recommendations on how to influence people using key behavioural drivers. Each of the fourteen chapters is broken up into lots of short sub-sections which makes the book very easy to digest and allows you to find specific topics of interest very quickly. This is one of the easiest digital marketing books to read. It’s a great book for marketers who want a short-cut to understanding what can influence our brain and how this can be translated into marketing strategies. 5. How to Get People to Do Stuff – Susan Weinschenk. Recommended by Roger Dooley. It’s one of those books that you find difficult to put down as it’s packed full of interesting and useful insights. It’s also easy to dip into to find a particular topic as each chapter is divided up into short sub-sections using informative headings. In addition, after each insight has been explained there is short summary of the related strategy. This assists you in digesting the important learning from each sub-section and makes it easy for you to pinpoint relevant content if you want to return at a later date. It total Susan outlines 114 helpful persuasive strategies. Probably one of the most well known digital marketing books you will come across and a must read for anyone involved in the field of conversion optimisation. It is a relatively short book on purpose to make it easily digestible and more likely to be used by the people who are involved in building websites and apps. Steve’s mantra is about keeping it simple and focus on a few key things that everyone involved in designing or evaluating websites should know. The book begins by setting out a few guiding principles of web usability, including “Don’t make me think” which is as simple as; “it should be self-evident. Obvious. Self-explanatory”. This might appear basic advice, but it is amazing how often such simple principles are forgotten in the heat of discussions about new web designs. Importantly much of the advice is based upon an excellent understanding of how people browse the web and how they interact with content and navigation elements. An important aim of the book to make the reader understand that usability testing does not need to be complicated and that you can do it yourself with a little bit of preparation. Steve is a great believer is doing-it-yourself and that one usability test is 100% better than none. He also makes a critical point that “Focus groups are not usability tests”. Focus groups are a potentially misleading method of research at the best of times, but they are totally inappropriate for evaluating the usability of a web page or user journey. If you are time poor, and struggle to read books, this is one book that I would definitely invest in today. I’m no designer, and have no intention of becoming one either, but this is an excellent book for you to grasp they key principles of how and why people interact with user interfaces the way they do. The book has been well researched as it is packed full of useful statistics and insights that support the design rules outlined. The first chapter is appropriately entitled “We Perceive What We Expect” and begins with how perception is biased by experience, current context and goals. Jeff explains how our brain filters our perceptions accordingly and the importance of considering mental processing when designing a user interface. Other topics covered in the book include how our vision is optimised to see structure, reading is unnatural, peripheral vision is poor, limits on attention shape our thoughts and actions, learning from experience and performing learned actions are easy, but problem solving and calculations are hard. Insights such as people focus on goals and pay little attention to their tools, reminds us about what matters in designing new experiences for our visitors and to stop putting barriers in place that prevent customers achieving their goals. 8. Drunk Tank Pink – The Subconscious Forces That Shape How We Think, Feel And Behave – Adam Alter. If you are interested in understanding the psychology of how human decision making is subconsciously influenced by such factors as our names, labels, symbols, culture, colours and our environment this is a brilliant book to read. You will be shocked by how our behaviour and perceptions are affected in obscure and surprising ways. However, Adam provides some fascinating and useful insights that can be used to challenge design thinking and develop hypothesis for A/B testing new customer experiences. All too often we assume that most people view the world in the same way that we do, but this book explodes that myth and shows how even subtle changes to the design of images and messages can drive different behaviours. Perhaps not the most obvious of digital marketing books but sometimes I think you need to look outside your topic of interest to find new and useful insights. This is another classic text and should be on any list of digital marketing books because it deals with psychological persuasion. The 6 principles of persuasion are now widely adopted by many digital marketers and there are a constant flow of articles based upon these psychological weapons. These have all become synonymous with Cialdini and persuasion. However, the book is still worth reading as Cialdini uses compelling narrative and detailed research to explain some ordinary and some extraordinary cases of persuasion. Each individual principle is a complex construct that Cialdini carefully unwraps and provides great insights into the different approaches used by people seeking to persuade. You will be shocked by the nature of some of the behaviour Cialdini uncovers as being influenced by common psychological weaknesses. Many famous and infamous events are dissected and explained using Cialdini’s deep understanding of human psychology. However, the book is useful for both generating ideas on how to make content more persuasive, but also how to avoid falling foul of people who are trying to manipulate you for their own personal gain. I’ve noticed this book on almost every reading list I have come across on social media and decided they can’t all be wrong. Given this was written over 70 years ago you might wonder why it is on a list of digital marketing books. Well, when I read it I was amazed at how informative and useful a guide to human behaviour it is and these principles are just as applicable to online as well as offline marketing. This book is a brilliant and practical guide to human behaviour and how to get the most out of people, whether you are trying to persuade or just motivate them. It is highly applicable to website optimization as the principles are the same however you communicate or interact with people. Why should you treat people any different when they come to your site than you would if they turned up at the door to your office. I highly recommend this book to to improve all aspects of your life and I’m sure it will also help generate some powerful ideas for improving your website and how you communicate with your customers online. Phil Barden is a highly experienced and knowledgeable marketer who brings together the latest psychological and neuroscience research and combines it with his marketing expertise. This is a fascinating and highly practical review of what we now know about what drives people to buy products and brands. Although this not an obvious choice for digital marketing books as it’s not specifically for digital marketing it is an especially insightful read on the science of buyer behaviour. From a marketing perspective his research into the 6 key implicit (psychological) goals that drive brand purchase is invaluable. Based upon experience and empirical research the psychological goals outlined in the book offer an essential framework for positioning a brand and evaluating the relevance of proposed marketing communications. It challenges a lot of the myths created by listening to what consumers say are important to them. This gives you a reality check so that you can be better informed and avoid some of the traps many marketers have fall into. An excellent book for understanding our ‘herd instincts‘ and how far reaching and ingrained the influence of others is in driving much of our behaviour. This book explodes many myths about economics, word of mouth marketing, market research and human nature in general. A must read for all marketers and anyone interested in human behaviour. Mark is an experienced advertising executive and so is able to put his research into context by offering practical advice on how to apply herd theory in a competitive business environment. Let me know if you have come across other digital marketing books that you think should be included in this list. Thank you reading my post. If you found this of interest please share using the social media icons on the page.